The Cultural-Natural Landscape of Ramsar is part of the Tentative list of Iran in order to qualify for inclusion in the World Heritage List. Ramsar is not a typical place on World Heritage journey through Iran. For us it was almost exactly half way from Masouleh to Gonbad-e Qabus so we decided to stay there overnight. Ramsar is known from two things – first is Ramsar Convention on Wetlands, signed in 1971 (many World Heritage Sites all over the world are protected areas under this convention). Second is the fact that Ramsar has the highest natural radiation in the (inhabited) world – there are scientific investigations about its influence on people's health, but the results for now are pending. Ramsar was extremely popular during Shah's times, it was Persian equivalent of Cannes or San Remo. 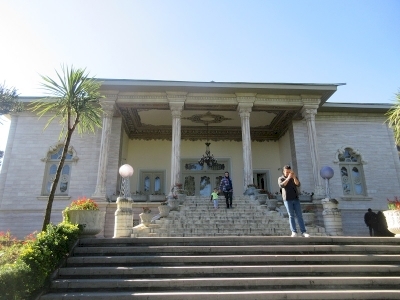 This popularity was due to Shah himself (both Mohammed Reza and his father, Reza Shah, who liked this place a lot and built a summer palace here). The palace suffered a bit during Islamic Revolution but was restored and now is open for visitors. It is undoubtedly the most popular monument in Ramsar. The palace is nice, but quite small and not very spectacular comparing to its european equivalents. Even more interesting are neighbouring buildings, such as royal baths. One of the buildings was adopted to very interesting Ivory museum, with several masterpieces of art made from this material. Although we found Ramsar quite pleasant, I cannot find anything that justifies outstanding universal value of this place. Maybe Iranian government should focus on nearby hot springs and the link to natural radiation to justify the uniqueness of Ramsar?